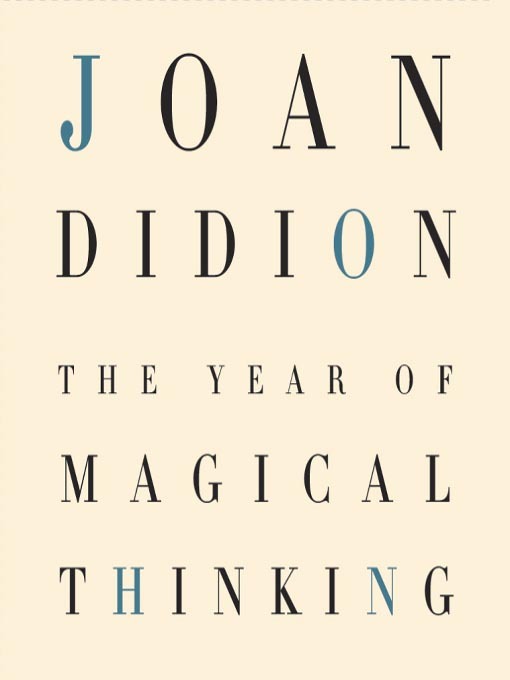 Joan Didion’s well-regarded memoir The Year of Magical Thinking recalls the year following the death of her husband and writing partner John Gregory Dunne. Didion and Dunne were married for 40 years and were literary royalty. They counted many other famous writers and celebrities among their friends. It would seem that theirs was a charmed life. John Gregory’s famous brother, Dominick, writes about his brother’s death here. “Life changes fast. Life changes in an instant,” Didion writes. And while we certainly all know this is true, Didion experiences it first hand at a particularly trying point in her life. She and her husband have just returned from the hospital where their only daughter Quintana is recovering from a particularly virulent flu. They’ve just sat down to dinner when Didion looks up from her salad and sees him slumped over the table. I have no idea what subject we were on, the Scotch or World War One, at the instant he stopped talking. The Year of Magical Thinking is not a romantic memoir. Didion, despite her sorrow, turns a clear, at times even dispassionate, eye on the nature of grief. She’s been trained to do that, of course. Does it lessen the impact of the story she has to tell? Not really. But was I as emotionally engaged as I thought I would be. Not really. This entry was posted in Book Chat and tagged 2012, Book Review, memoir by Christie. Bookmark the permalink. Would you mind doing a review on the Red Door/House before Tuesday? Gonna be hard to write a review; I haven’t read the book.